On the surface, from the perspective of someone new to the genre, there’s certainly nothing remarkable or striking about Watchmen. It looks like any other run-of-the-mill superhero team comic book. It’s so much more than that. So many things set Watchmen apart from other comic book series. “So, why do we see Batman cartoons and kids always playing with other superhero toys other than Watchmen?” You may be asking. Well, that’s because Watchmen is not for kids; no sir. When you read a fight scene in Watchmen, the last thing you’ll be seeing is the Pows! and Kraks! That so often accompanies a superhero story. Instead you’re confronted with brutal, unforgiving and bloody violence that does its part in telling the reader in no uncertain terms, “This isn’t a fairy-tale”. Above that, the thing that I believe sets Watchmen apart from other superhero stories is the fact that the characters are human. Each character has a unique personality that completely throws basic archetypes out the window. Nobody in the story is invincible. The heroes and their story are so much more than your typical superheroes because, at the end of the day, every single action in the Watchmen story is morally questionable. Rorschach is always hell-bent on justice, no matter what the cost. But did he have to kill the kidnapper’s dogs? Did he have to drop Captain Carnage down that elevator shaft? I fear that I’ve gone off topic and spent too much time talking about why Watchmen is so unique and not nearly enough on what the actual story encompasses. Watchmen begins with the death of Edward Blake, also known as The Comedian. In the middle of the night in New York City, Edward Blake’s penthouse is broken into and following a brief fight between himself and his attacker, Blake is thrown from his window and falls to his death on the street below. Following the Keene Act of 1977, all masked vigilantes were requested to either pledge themselves to government service or reveal their identities and retire from crime-fighting. All of the Watchmen complied, except for Rorschach. When he hears of Edward Blake’s murder, Rorschach, who is now a wanted man for refusing to give himself up, takes it upon himself to investigate the circumstances. When he learns that Edward Blake was actually his old colleague The Comedian, he starts to formulate an idea that someone is plotting to kill all of the masked heroes, himself included. The one message that gets portrayed through Watchmen is that there is often more to the story than binary good/bad in characters. 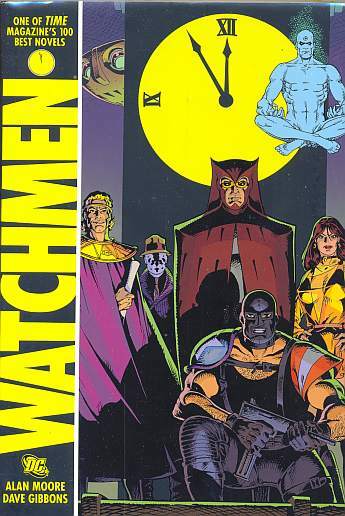 Alan Moore’s Watchmen blurs the traditional line between good and evil and uses unique and irreplaceable characters to design a story where there aren’t really any true heroes. Watchmen is a brilliant achievement that has clearly stood the test of time. I heartily recommend it to anyone who considers themselves a fan of comic books. I give it 5/5 stars. Welcome to We Heart Reading! Great first post. I really should read comic books more. I found this piece of writing very helpful. I suggest that you continue writing and developing your skills. After reading this i’ve decided to purchase Watchmen. Well done! I’m really glad you found it helpful! I’m always happy to work on my skills – is there anything in particular you think I should improve upon? Awesome post, man! So glad to have you!